Despite all the info we have at YodaGuyApartments.com we still have periodic questions. This is where we try to answer them. Remember that St Martin is a different country. Things that are part of the U.S. or European systems do not necessarily apply here and there are things we do to overcome the logistics of dealing internationally from a small island. If you don’t find an answer here, check the details page. If that fails send us an email. Can I pay the balance by check? No. A check can not work for us here as we are a different banking system and it takes weeks to clear and the charges can be horrendous. It needs to be cash. Can I pay the balance by credit card? WE PREFER NOT TO. Our PayPal account is in the USA and we need money here to pay our bills. That is why a condition of renting is that you pay the balance by cash or traveler’s checks. We don’t process credit cards for the apartments via our shop on the Dutch side of the island because it is a different country and we don’t want to pay tax in two countries. Can I pay the balance by PayPal after I arrive? No. The paypal system will know you are in a different country. Often they think we are putting through a fraudulent charge and freeze all your payments and give you procedures needed to clear the problem that you can only do in the USA. Bring cash. Why can’t I checkin before 4.00 p.m.? Because Gloria has to clean rooms and organize bedding and towels between guests who may not check out until 12.00, Our prices are low because we don’t have an army of hotel staff to deal with such issues. Consequently, checkin is at 4 p.m. If you picked up a car from the airport, you can call from that office ( Dutch: 599 524 1586 French: 0590690 17 08 60 ) and maybe the room will be ready for you. But you can always stop at the supermarket on the way and stock up on groceries and that may take up the rest of the time. If you take a cab, you can call and maybe leave your bags till the room is ready. Why do I have to call from the airport.? Because there are no reception staff at HMV so Gloria has to estimate what time you will arrive so she can go out to meet you. Planes can be late and plans can change and Gloria can’t stand in the road for hours hoping you’ll show up soon. You call from the airport to let us know you are on your way and based on your method of transport and knowledge of the island we guage how long it might take you to get here. There are so many cell systems worldwide, many of which have associate companies here. But the exact requirements for linking to their services vary and some require you to visit their office. We are not experts on YOUR cell company and can not guarantee your phone will work when you arrive. That’s why we offer to rent you a local cell phone. We provide much more than most people expect and recommend you read the apartment details which helps you understand what you do and don’t need to bring with you. What do you recommend to do on the island? St Maarten has a lot of options compared to other Caribbean islands. There’s a variety of beaches, watersports, fabulous excursions, great shopping and diverse activities from visiting a rum plantation to sailing America’s Cup boats. We have created an activities blog for our past guests to tell you what THEY enjoyed and hopefully you’ll add your own comments when you get back home. Do we need to bring Euros or will places accept US dollars? Euros are not necessary. Almost everywhere accepts dollars... in fact some give better deals on the conversion than the banks. 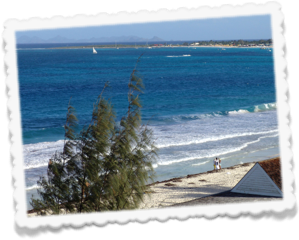 See you in St Martin!